I’ll be sharing the full set of images from this London wedding on the blog very shortly, but I just wanted to share one (of many!) of my favourite images from the day. I’ve always thought that the first dance at a wedding is a moment of absolute poignancy… After the ceremony, the day becomes so full of distractions for the Bride & Groom. There are people to see & speak to, speeches to give, meals to eat, and not to mention Champagne to drink! There’s a real party atmosphere throughout the day, and sometimes it feels as though it’s difficult for the happy couple to really connect with the sole reason for all the celebration. And that reason is…? 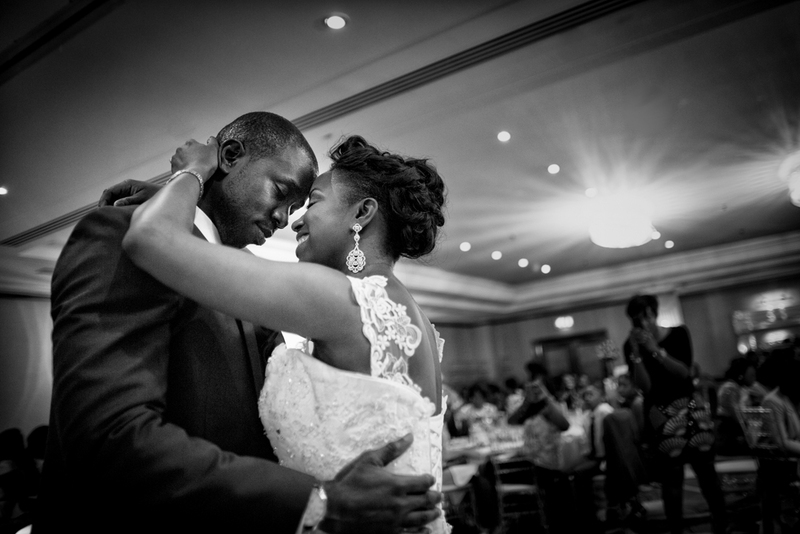 For me, as a documentary wedding photographer, the couple’s first dance as Husband & Wife is THE moment to watch out for. It’s the time of the day where the sudden realisation of “We did it” sets in. As they hold each other, it’s the first real moment of intimacy they share as Husband & Wife. Despite all the people watching it always feels as though, just for a moment, they’re finally able to appreciate what the day is all about.